A big time saver for a lot of our owners is the automatic emails that the system sends out. From the moment a booking is taken the system sends out branded emails for you, from thanking the guest for their booking, to chasing payments, to asking for feedback after their stay. This essentially means your business is able to run without your input allowing extra time to focus on other apsects of your holiday property business. You have the ability to determine at what point during the booking your emails go out. For example if you want the full balance paid straight away you can have the reminder emails to go out immediately. Likewise if you don't need payment until 2 weeks before you can set it so the emails go out at a later date. We have tried to make the automated emails flexible to suit the way in which different property owners work. 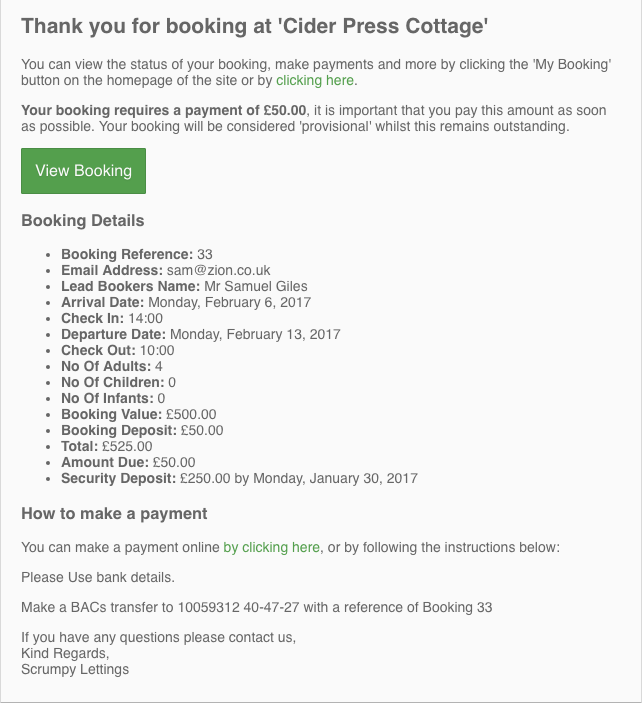 This email goes out to the guest as a confirmation once they have booked a stay through the website. An email goes out to remind the guest to pay their securirty deposit, they also recieve a thank you email once it has been paid. This is an email asking giests to agree to the terms and condionts for their booking. You can set the frequency in which you want payment reminder emails to go our to the guest and these will go out automatically. Once a guest has made a payment they will recieve and email with the payment reciept. You can deicde when you want the check in details to be sent out to the guest - this is usually just before the date of arrival. Once a guest has stayed a feedback email will go out them asking about their stay. If you are currently running a holiday property business and are drowning in admin we would love to help make your life easier! Please get in touch if you would like to find out more about how SCRUMPY can assist you in managing your holiday property.